Our contributor Dr Corrinne Burns is a chemist (not a person who works in a pharmacy and doles out medicine, but an expert in the science of chemistry). She is an exhibit designer at the Science Museum, London and Guardian columnist. She was interested in Aztec women’s beauty routines and shares her fascinating report on Jump! Mag for Girls. Who were the Aztecs of 16th Century Mexico? Most people immediately think of human sacrifice. Well, they did do a fair bit of that! But we can thank them for chocolate, vanilla, popcorn and turkey, so they can’t be all bad. And, actually, they were a pretty enlightened people in many ways. Unlike much of the rest of the world at that time, the Aztecs insisted that their girls went to school. And when an Aztec woman got married, she could expect her husband to treat her as his equal. Aztec women were good at taking care of their appearance and personal hygiene. The Aztecs were much cleaner than Europeans of the time. Aztec people liked to bathe every day, and they built huge aqueducts to bring fresh water into the big city of Tenochtitlan – present-day Mexico City. Aztec women also had a lot of beauty tricks, and they liked to make their own make-up and shampoo from the herbs and plants that grew in the Valley of Mexico. But the Aztecs were definitely keen on the natural look. In fact, they looked down their noses at overly made-up women. What Did An Aztec Beauty Regime Look Like? Well, let’s start with washing and cleanliness. Aztecs didn’t use bars of soap like we do. Instead, they used two plants that have a natural soaping action. To wash their skin, they’d use a plant which they called xiuhamolli, but which we call Saponaria americana. The root of xiuhamolli contains natural chemicals, called saponins, which dissolve grease – just like your washing up liquid does. 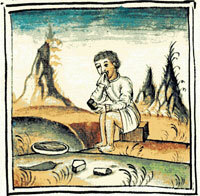 To wash their clothes, the Aztecs used a plant called copalxocotl, which we know as Cyrtocarpa procera. The Spanish called this plant the “soap-bead tree”, and were very impressed with its effectiveness. A Spanish doctor of the time, Francisco Hernandez, wrote in his notes that copalxocotl was just as good as the best Spanish soap. The Aztecs knew all about skincare, too. To keep the face looking soft, the Aztecs applied a watery preparation of ecapatli (Cassia occidentalis, a type of Mexican senna) and tlalquequetzal, a kind of yarrow. That sounds like quite a nice way to wash your face – except that the original Aztec recipe also says to chuck in a bit of pigeon poo! If you had any skin sores or infections, you might use a bit of oxitl, an ointment made from the resin of the pine tree, Pinus teocote – which sounds a lot nicer than pigeon muck. The Aztecs made their own toothpaste, using the roots of tlatlauhcapatli, which is a type of geranium, with some salt and a bit of chilli. This was probably quite good at keeping the mouth clean because the salt in the mixture would have helped to treat mouth infections. In fact, if you’ve ever had a gum infection, your dentist probably told you to use a salty mouthwash. If you didn’t fancy using geranium toothpaste, you could also have rubbed your teeth with charcoal. Charcoal would have helped keep your teeth clean by acting as an abrasive, rather like our toothbrushes do. If your gums were really in a bad way, the Aztecs would suggest making up a mixture of egg yolk and white honey, adding the seeds and roots of a nettle, and bathing your mouth with that, instead. What About Aztec Make Up? So, now your basic hygiene is taken care of – what next? Well, although the Aztecs weren’t big fans of make-up, they did use a little bit of it. They took insects called Coccus axin, and ground them into an oily yellow paste. This preparation, called axin, was used as a blusher and as a lip balm and gave a nice golden glow to the skin. You could even use axin on your hair, to add a bit of colour and shine. For a darker hair colour, the Aztecs would get some black clay, and mix it with the powdered bark of a resinous tree called uixachin – or, as we know it, Acacia farnesiana. Black clay contains lots of iron, and uixachin contains natural chemicals called tannins. When iron is mixed with tannins, dark colours are produced – something that we take advantage of today when we’re dyeing leather. Finally, the Aztecs were very fond of sweet-smelling flowers, and they used them to make scented waters. You might have done the same thing if you have ever mixed rose petals in water to make perfume. One Aztec recipe called for petals of magnolia, pine needles, leaves of cedar and marigold heads to be steeped in water overnight. The next morning, the water was used as a sweet body wash.
That sounds like the perfect way to complete your Aztec beauty regime! I found it very interesting to read. I really enjoyed it.